This is the current color version of the Friday patch for the 90th Fighter Squadron, the F-15E Strike Eagle squadron located at Elmendorf AFB, AK. This is worn on the left sleeve of the flight suit and does not come with velcro already attached (but can send a piece, if needed......sts). 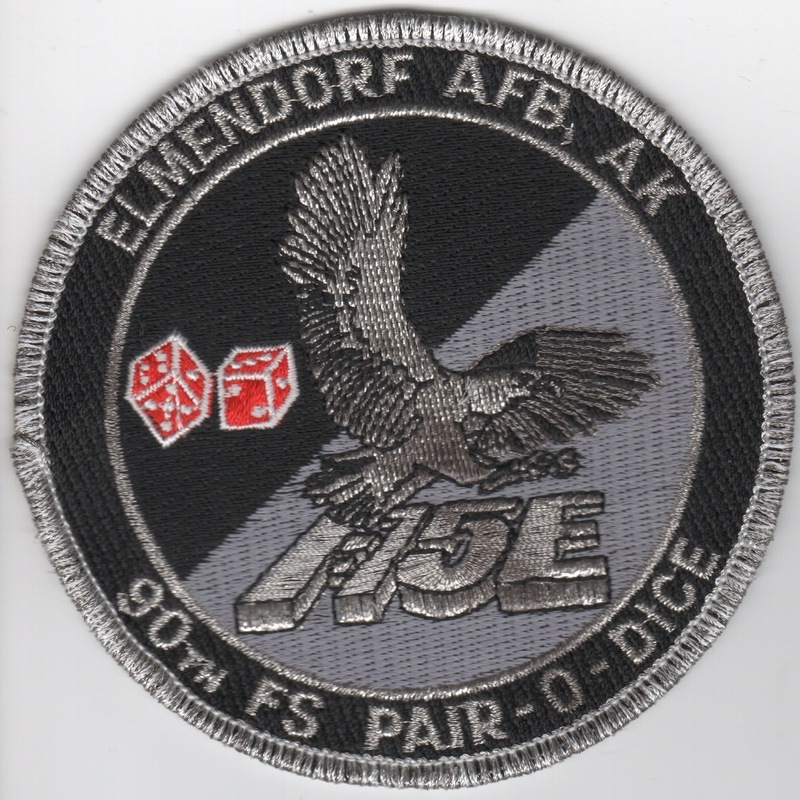 This is the current color version of the Friday patch for the 90th Fighter Squadron, the F-15E Strike Eagle squadron located at Elmendorf AFB, AK. This is worn on the left sleeve of the flight suit and does come with velcro already attached. 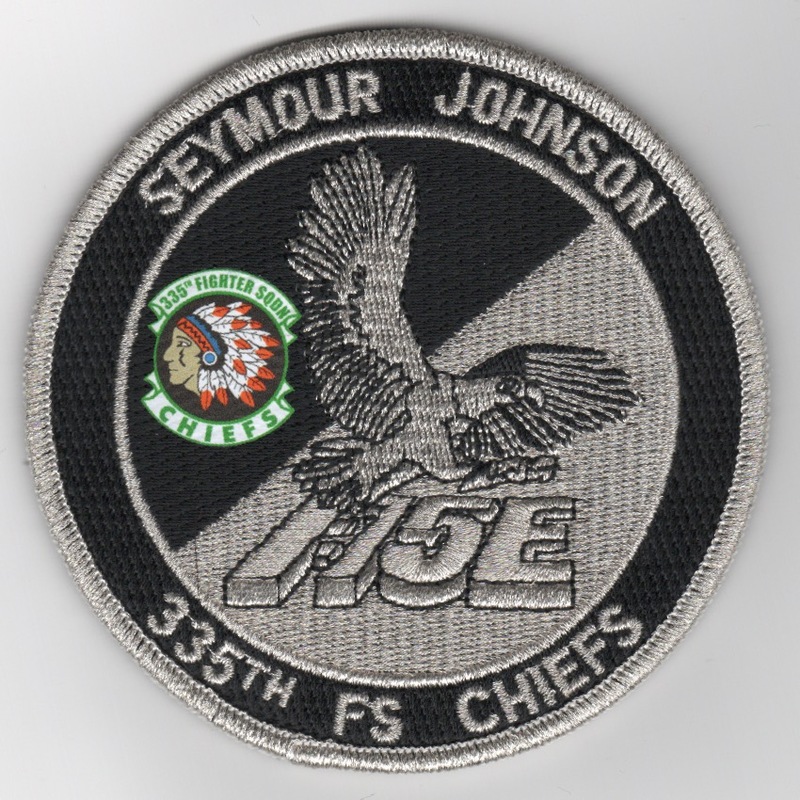 This is the current black version of the F-15E "TINSEL" patch for the 333rd Fighter Squadron, one of the F-15E Strike Eagle training squadrons located at Seymour Johnson AFB, NC. This is worn on the left sleeve of the flight suit and does not come with velcro already attached (but can send a piece, if needed......sts). 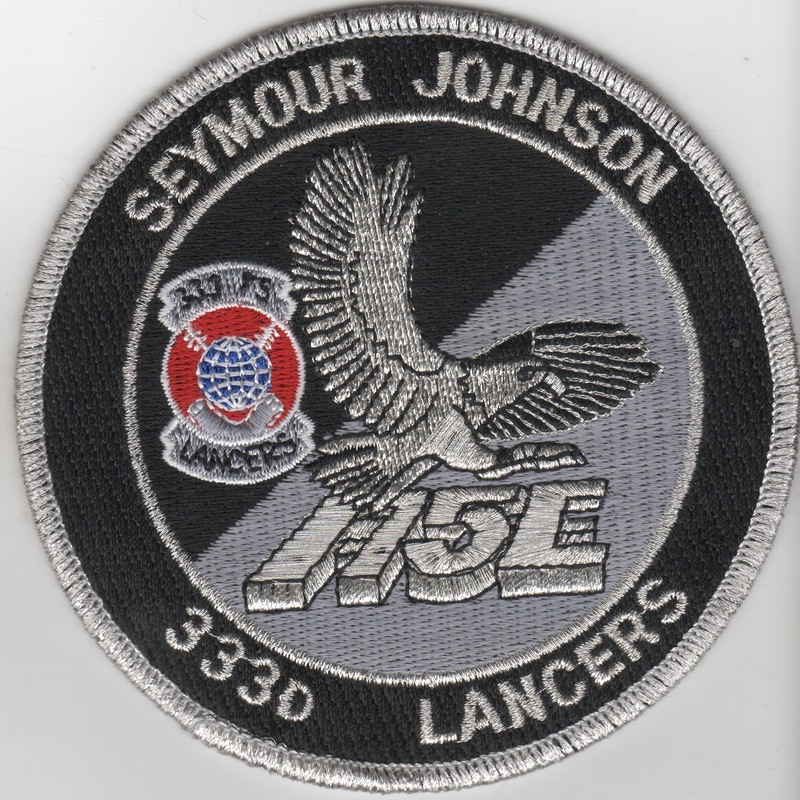 This is the current desert version of the patch for the 333rd Fighter Squadron, one of the F-15E Strike Eagle training squadrons located at Seymour Johnson AFB, NC. This is worn on the left sleeve of the flight suit and does not come with velcro already attached (but can send a piece, if needed......sts). 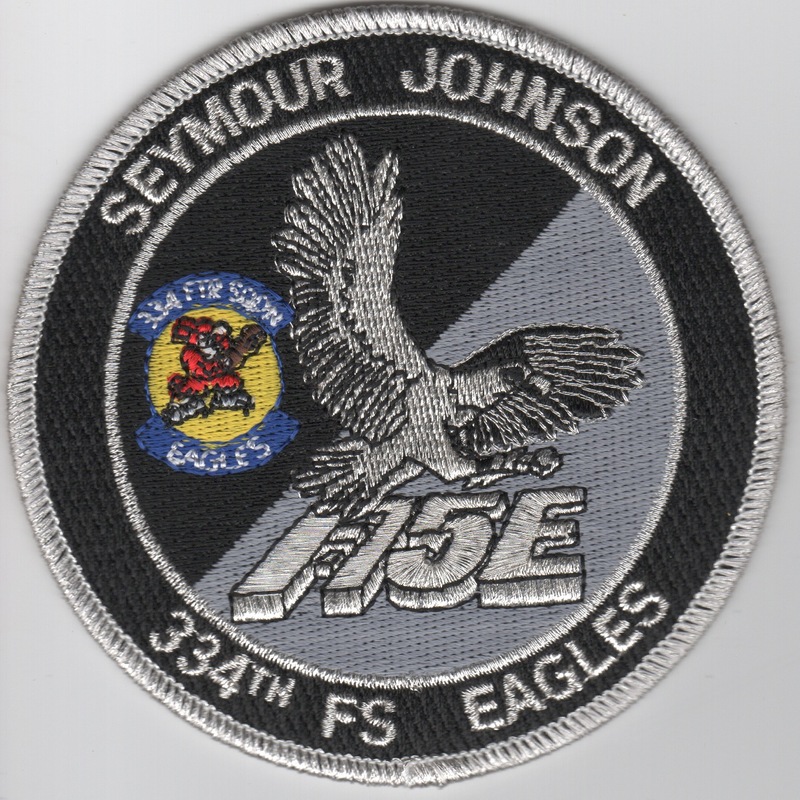 This is the black version of the F-15E aircraft patch for the 334th Fighter Squadron, one of the F-15E Strike Eagle training squadrons located at Seymour Johnson AFB, NC. This is worn on the left sleeve of the flight suit and does not come with velcro already attached (but can send a piece, if needed......sts). 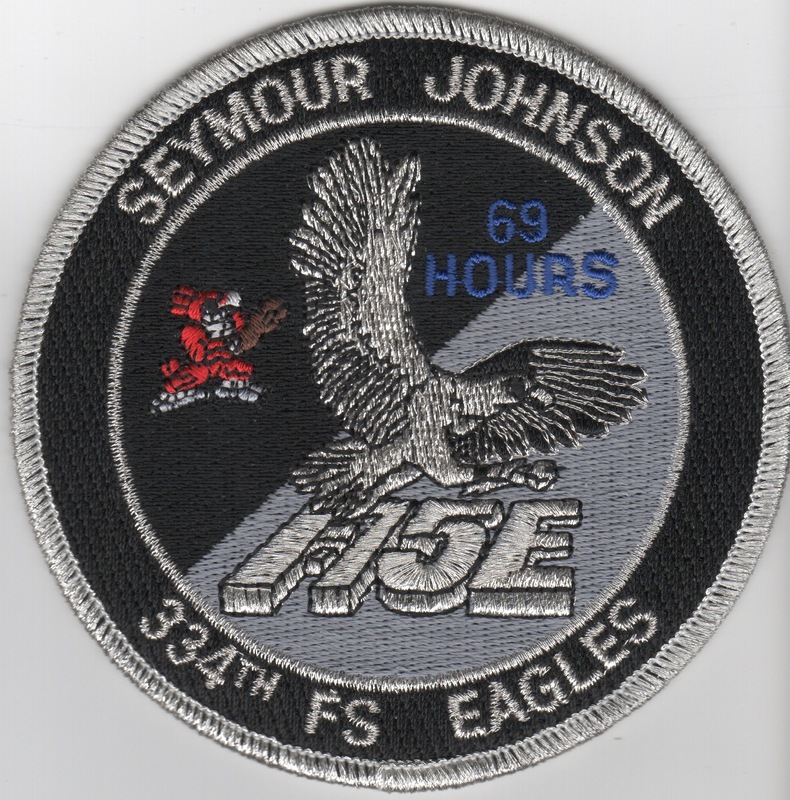 This is the black "69-Hour" version of the F-15E aircraft patch for the 334th Fighter Squadron, one of the F-15E Strike Eagle training squadrons located at Seymour Johnson AFB, NC. This is worn on the left sleeve of the flight suit and does not come with velcro already attached (but can send a piece, if needed......sts). This is the current black version of the Friday patch for the 335th Fighter Squadron, one of the F-15E Strike Eagle operational squadrons located at Seymour Johnson AFB, NC. This is the patch we wore on the left sleeve of our flight suit and does come with velcro already attached. 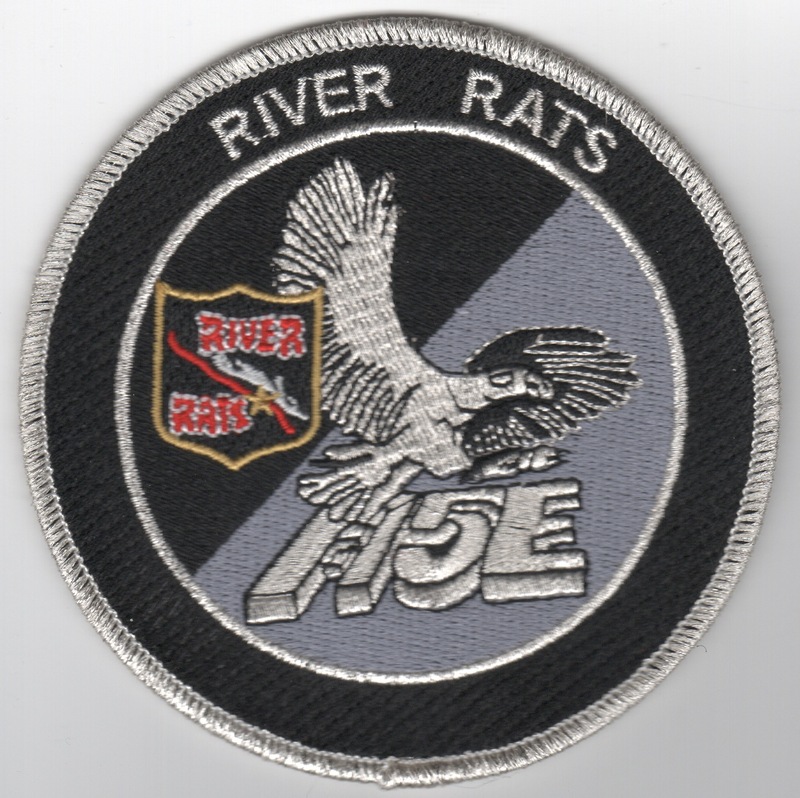 One thing you will not about this patch is the "vinyl" squadron logo. The old version of the "tinsel" patches had logos that were barely recognizable, so we created this new version with a perfect representation of the squadron patch.....and it's durable!! 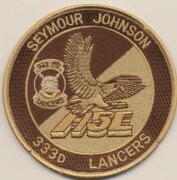 This is the current desert version of the Friday patch for the 335th Fighter Squadron, one of the F-15E Strike Eagle operational squadrons located at Seymour Johnson AFB, NC. This is worn on the left sleeve of the flight suit and does not come with velcro already attached (but can send a piece, if needed......sts). This is the current black version of the Aircraft patch for the 336th Fighter Squadron, my favorite of the F-15E Strike Eagle operational squadrons located at Seymour Johnson AFB, NC. This is worn on the left sleeve of the flight suit and does not come with velcro already attached (but can send a piece, if needed......sts). This is the current desert version of the Aircraft patch for the 336th Fighter Squadron, my favorite of the F-15E Strike Eagle operational squadrons located at Seymour Johnson AFB, NC. This is worn on the left sleeve of the flight suit and does not come with velcro already attached (but can send a piece, if needed......sts). This is the desert version of the F-15E "tinsel" patch for the 336th Fighter Squadron, my favorite of the F-15E Strike Eagle operational squadrons (since it was my squadron!) located at Seymour Johnson AFB, NC. 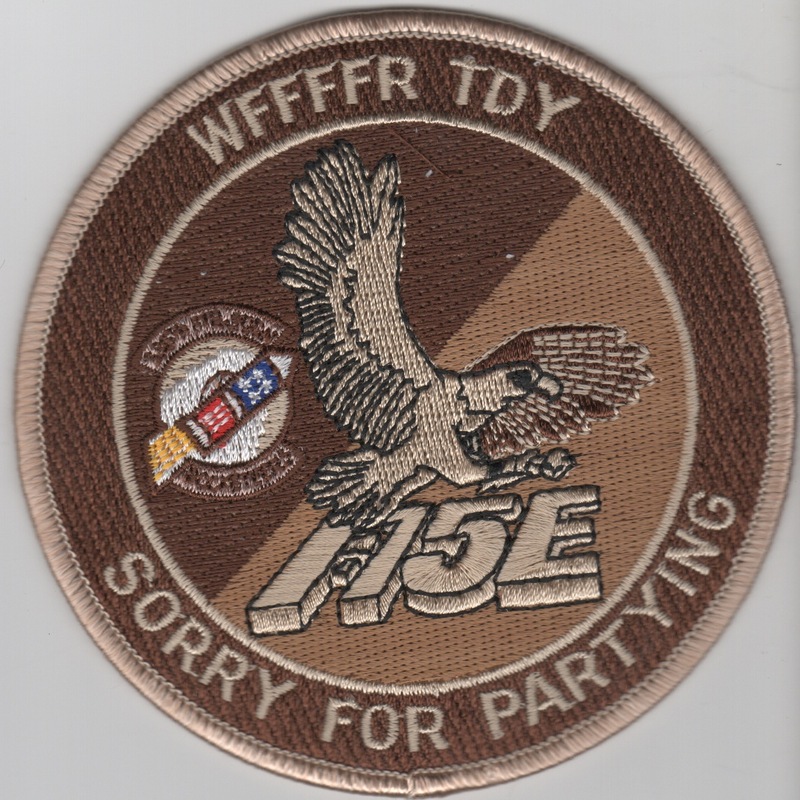 This patch says "WFFFFR TDY" at the top and "SORRY FOR PARTYING" along the bottom. This is worn on the left sleeve of the flight suit and does not come with velcro already attached (but can send a piece, if needed......sts). 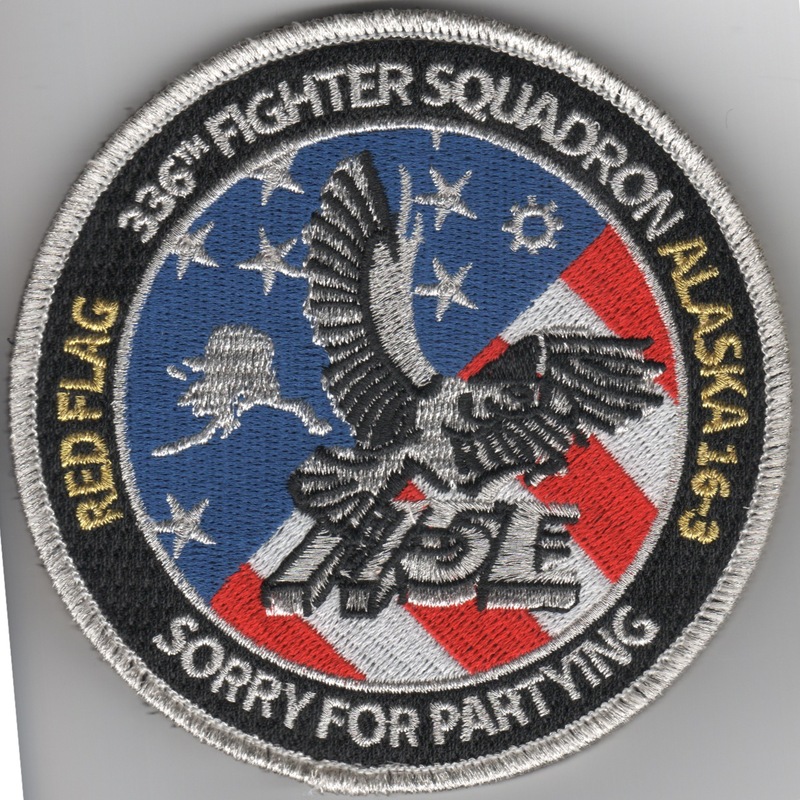 This is the Red/White/Blue F-15E 'Tinsel' patch created by 336FS for their participation in Red Flag 16-3 and says "Sorry For Partying" (sounds like my old squadron!!). This patch comes with velcro attched. This is the normal black version (with white letters) of the 389FS's Friday patch for the F-15E Strike Eagle squadron located at Mountain Home AFB, ID. This is worn on the left sleeve of the flight suit and does not come with velcro already attached (but can send a piece, if needed......sts). 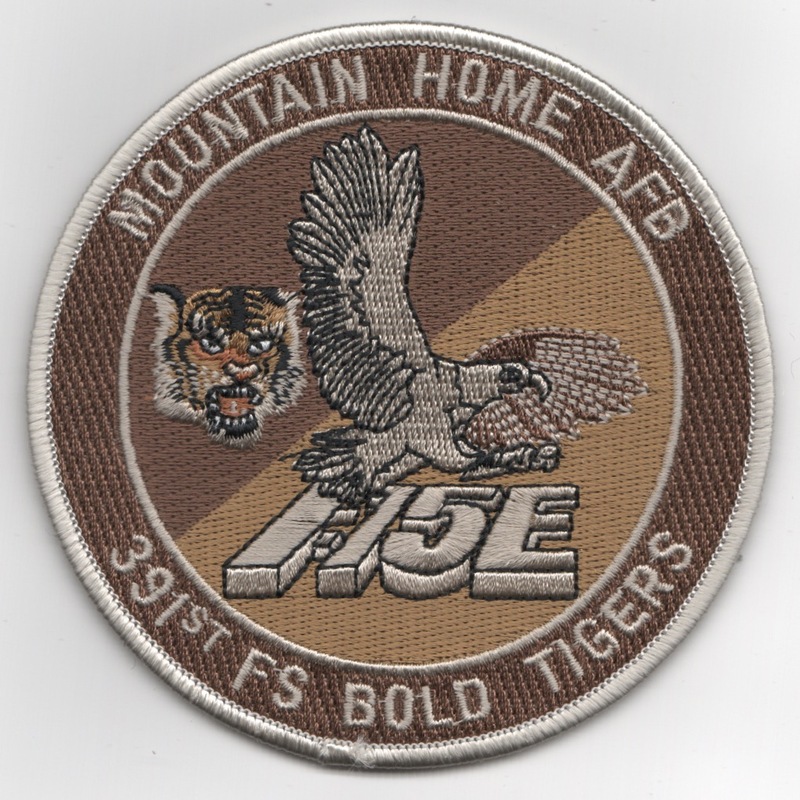 This is the normal black version (with white letters) of the 389FS's Friday patch for the F-15E Strike Eagle squadron located at Mountain Home AFB, ID. This is worn on the left sleeve of the flight suit and does come with velcro already attached. 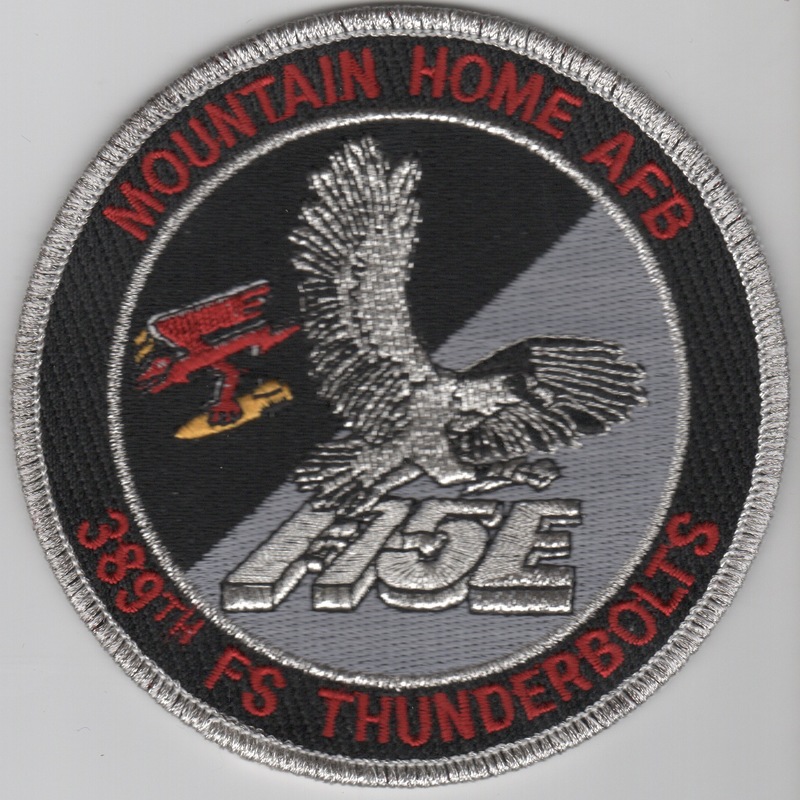 This is the "red-lettered" version of the 389FS's Friday "Tinsel" patch for the F-15E Strike Eagle squadron located at Mountain Home AFB, ID. This is worn on the left sleeve of the flight suit and does not come with velcro already attached (but can send a piece, if needed......sts). This is the "red-lettered" version of the 389FS's Friday "Tinsel" patch for the F-15E Strike Eagle squadron located at Mountain Home AFB, ID. This is worn on the left sleeve of the flight suit and does come with velcro already attached. This is the color version of the 391st Friday patch for the F-15E Strike Eagle squadron located at Mountain Home AFB, ID. This is worn on the left sleeve of the flight suit and does not come with velcro already attached (but can send a piece, if needed......sts). (Another AV8RSTUFF creation): The 391st Fighter Squadron is part of the 366th Fighter Wing at Mountain Home Air Force Base, Idaho. It operates McDonnell Douglas F-15E Strike Eagle aircraft conducting close air support missions. Their mission is to perform close air support, interdiction, strategic attack, suppression of enemy air defense, and defensive counterair missions, employing the full array of U.S. Air Force capabilities including precision-guided munitions, inertially- aided munitions, night vision goggles, fighter data link, and Low Altitude Navigation and Targeting Infrared for Night (LANTIRN). This is their (redesigned) desert version of the 391st Friday "TINSEL" patch for the F-15E. This is worn on the left sleeve of the flight suit and does come with velcro already attached. This is the color version of the squadron patch for the 422nd Green Bats out of Nellis AFB, NV. They fly the F-15E Strike Eagle in order to operationally test all new "ideas" before sending it to the operational squadrons. This is worn on the left sleeve of the flight suit and does NOT come with velcro already attached (but can send a piece, if needed......sts). This is the color version of the squadron patch for the 422nd Green Bats out of Nellis AFB, NV. They fly the F-15E Strike Eagle in order to operationally test all new "ideas" before sending it to the operational squadrons. This patch DOES come with velcro attached. 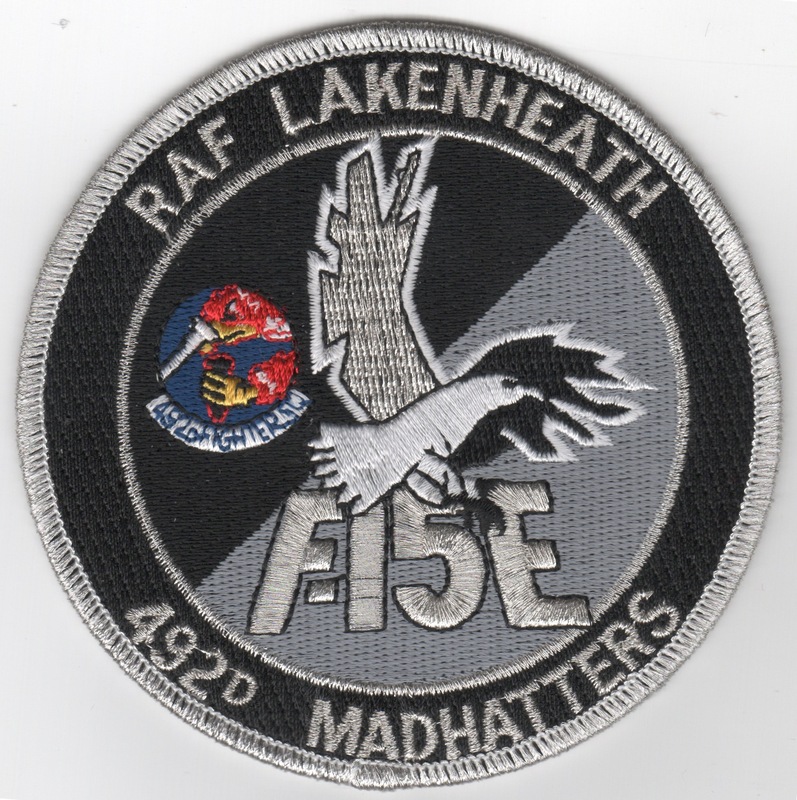 This is the black version (with white letters) of the Friday "Tinsel" patch for the 492FS Madhatters out of RAF Lakenheath. They are one of the "forward-stationed" squadrons and fly the F-15E Strike Eagle. This is worn on the left sleeve of the flight suit and does NOT come with velcro already attached (but can send a piece, if needed......sts). This is the red-letterd version of the Friday "Tinsel" patch for the 494FS Panthers out of RAF Lakenheath. They are one of the "forward-stationed" squadrons and fly the F-15E Strike Eagle. This is worn on the left sleeve of the flight suit and does NOT come with velcro already attached (but can send a piece, if needed......sts). This is the desert version of the Friday "Tinsel" patch for the 494FS Panthers out of RAF Lakenheath. They are one of the "forward-stationed" squadrons and fly the F-15E Strike Eagle. This is worn on the left sleeve of their desert flight suit and does NOT come with velcro already attached (but can send a piece, if needed......sts). Homepage | Order F-15E Squadron Patches!